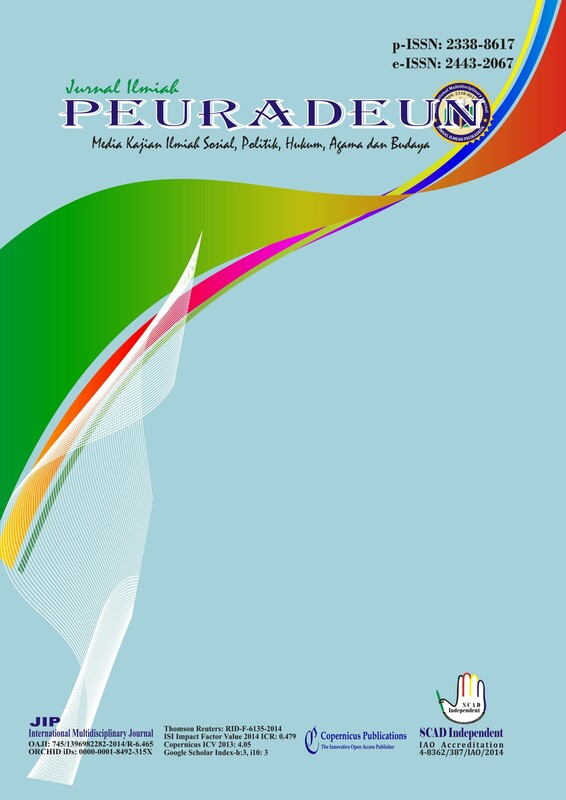 Jurnal Ilmiah Peuradeun (JIP), International Multidisciplinary Journal is published every four months, January, May and September. JIP is an Open Access journal in print and online. Jurnal Ilmiah Peuradeun (JIP) publishes the core ideas of the article or the research results of the study, which had a significant impact and a real contribution to the community at large, practical and academic world. JIP published in accordance with SK PDII-LIPI with p-ISSN: 2338-8617 and e-ISSN: 2443-2067, with the issue of Social Studies, Politics, Law, Religion and Culture. The main objective of the Jurnal Ilmiah Peuradeun (JIP) is to disseminate scientific knowledge and generate debate in an interdisciplinary context, linking the different areas of sciences such as social, political, law, religion and culture. Thus, it is contributing this will help to the societies development with a rigorous scientific basis, internationally proved. Jurnal Ilmiah Peuradeun (JIP) as an Open Access journal is licensed under a Creative Commons 4.0 International License (CC-BY-NC-ND) and Department of Labor United States of America. Copyright completely on author and under SCAD Independent.